The username and password you used to create your Intrinio account are not the same as your API Keys/Access Keys. Note that we use API Keys and Access Keys interchangeably. You use your created username, usually your email, and password to login at intrinio.com/login. Once you login in to your account page, you'll be able to access your API keys. 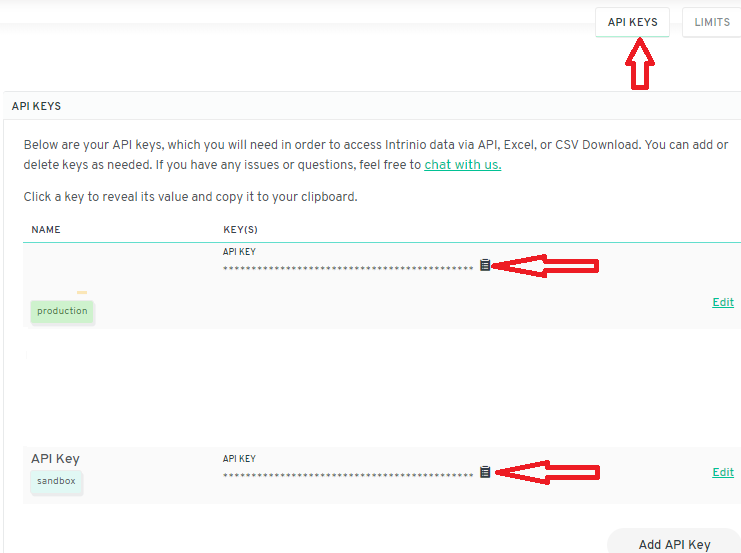 Your API keys are created for you, and are located in your account page, here, under the "Access Keys" section. You will copy and paste the access key by clicking the little clip board icon. You can copy and paste these keys into Excel, the Excel Screener, or your API application to authenticate. You can delete your keys, and create new keys as well, from your account page. This article shows how to use your API keys for authentication.